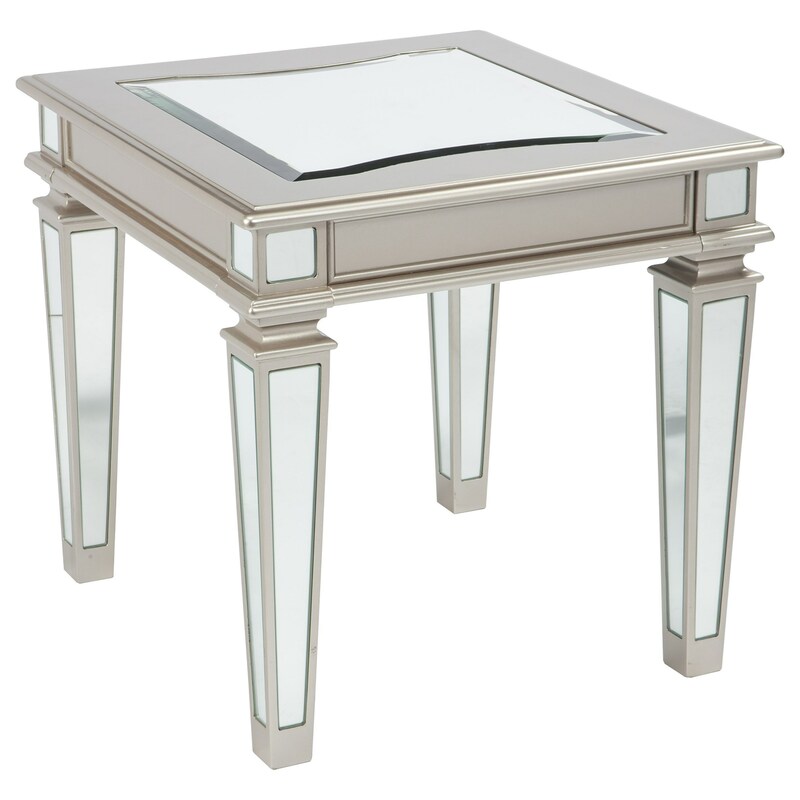 Mirrored panels add sparkle to the classic silhouette of this end table. The silver finish of the table frame complements the mirror panels at corners, on the tapered legs, and the beveled mirror glass inset on the table top. The inverted shape of two sides of the inset glass and the substantial molding provide architectural detail to this glam accent. The Tessani Silver Finish Rectangular End Table with Mirror Panels by Signature Design by Ashley at Furniture Fair - North Carolina in the Jacksonville, Greenville, Goldsboro, New Bern, Rocky Mount, Wilmington NC area. Product availability may vary. Contact us for the most current availability on this product. Make a bold statement of glamorous style statement with your choice of pieces available from this accent furniture collection. Mirror panels and a silver finish provide a light and bright style for your living room. The Tessani collection is a great option if you are looking for Glam furniture in the Jacksonville, Greenville, Goldsboro, New Bern, Rocky Mount, Wilmington NC area. Browse other items in the Tessani collection from Furniture Fair - North Carolina in the Jacksonville, Greenville, Goldsboro, New Bern, Rocky Mount, Wilmington NC area.